Will 'Christmas Creep' Gobble Up Thanksgiving? As you’re buying the green beans and turkey this Thanksgiving, you might want to consider a few added incentives. That’s because Thanksgiving has competition — Christmas Creep. That’s the growing trend for stores to get the jump on Christmas sales by putting out the tinsel and offering deals, on or even before Turkey Day. 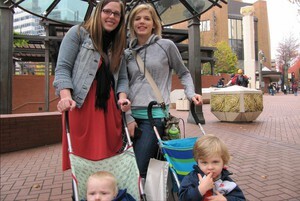 Courtney Hunter and Amanda Black out for a little early Christmas shopping at Portland’s Pioneer Courthouse Square.